Ice cube trays are a must-have if you don’t have an ice cube maker. A good ice cube tray should make nice-sized ice cubes that can be easily removed from the tray once they're ready to go. Some models even come with a lid to prevent freezer odors from being absorbed by the ice cubes. But with so many models out there, getting the best one can be quite challenging. So, we have picked the best of the best ice cube trays you can buy in 2018 and included their top features, ease of use, and price in our review to spare you the effort. 1. WHAT ARE ICE CUBE TRAYS? 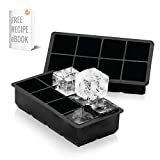 Ice cube trays are relatively small-sized trays divided into square compartments that can be filled with liquids and put in your freezer to make ice cubes at home They are a cheap and affordable alternative to ice makers. Most ice cube trays are designed to give ice a square shape once frozen. Ice cube trays come in various sizes, shapes, and materials. The most popular ones are the ones used to freeze water into square, round, and rectangular shapes. Also, the most used materials are plastic, metal, and silicone. Some of the best ice cube trays are made of silicone because it very flexible and allows ice cubes to come out easily. 2. HOW IS AN ICE CUBE TRAY USED? Fill the trays with water or other liquid, put the lid on (if any), and place them in the freezer to make the ice cubes. Leave for about six hours. Remove the ice cubes by gently twisting the tray. 3. WHERE SHOULD YOU PLACE AN ICE CUBE TRAY? An ice cube tray should be placed on a flat surface in the freezer. Some freezers come with special compartments for ice cube trays. If yours doesn't have one, find a flat surface to position the tray. TIP: The back of the freezer is usually the coldest spot, hence it will take the shortest time there for water to freeze. 4. WHERE CAN YOU BUY ICE CUBE TRAYS? Ice cube trays usually come as freezer accessories. If your freezer lacks such items or you need a replacement, you can buy them from any local store that sells freezer parts and accessories. You can also order them online from specific sellers. 5. WHICH IS THE BEST MATERIAL FOR ICE CUBE TRAYS? The best ice cube trays are made out of plastic, stainless steel, or silicone. Metal is the most rigid one and not widely used. Plastic is semi-flexible while silicone is the most flexible, which can make a world of difference when trying to get the ice cubes out. However, silicone may leave a bitter flavor when the ice melts. TIP: To remove the nasty silicone flavor, mix 1 part apple cider vinegar with five parts hot water, let the water cool a bit but not to room temperature and if the tray can handle some heat, let it soak in the mix a bit. Then rinse it out with hot water. Or simply let the tray stay in water for up to five hours before use. We picked the best ice cube trays on the market ourselves and asked our team of experts to review them by looking at their features, pros & cons, price, seller, and warranty. Tons of useful information was gathered from users who had already used those products. According to our experts, the prices of some the best ice cube trays can vary from as little as $5 to roughly $35. Even some of the most expensive models can be found at two-digit prices. One of the top factors that determine an ice cube tray's price is the material. Plastic trays are the cheapest but also last the shortest. Silicone is a bit more expensive than plastic but more popular and durable. Stainless steel ice cube trays are the most expensive but also the most durable. The special design water filled flow for you to easily spread the water in the block. The DecoBros 3 Pack Silicone Cube Ice Tray contains three 7.9 x 4.8 x 4.1 inch (20 x 12 x 10 cm) ice cube trays. With one tray you can make fifteen 1x1x1 inch ice cubes. The unique design of the tray makes it easy for water to spread throughout the block. Since the trays are made of soft silicone, it’s very easy to push out the ice cubes without the need of extra pressure. The trays clean up pretty fast and can withstand temperatures of up to 392°F (200℃). 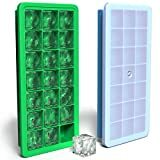 You can get the DecoBros Ice Tray from Amazon for $13. The OMorc Ice cube trays are made from food grade plastic with a flexible silicone bottom that make it easy to release the cubes. One tray produces 14 ice cubes (the package contains 4 trays). Each tray comes with a spill-resistant removable lid. The product is BPA free and LFGB certified. The OMorc ice cube trays are stackable and dishwasher safe. They are ideal for use in bars, at home, or at parties. The flexible well-shaped silicone bottom allows for easy removal of the ice cubes. Since each cube compartment is separately shaped, pushing the cubes out is relatively easy. The tray has a space-saving design. Since it has a tight lid, you can place it in the freezer at any angle without worrying about spills or drips. You can also stack the trays to save on freezer space. This ice tray produces odorless ice cubes as the lid ensures no smell from the freezer finds its way to the cubes. 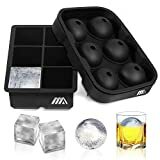 OMorc Ice Cube Trays sell on Amazon for $12-$17 (depending on the model). The SAWNZC Ice Cube Trays are made of 100% food-grade silicone. They are FDA approved and BPA-free. Each tray makes four diamond-shaped ice cubes which are slow-melting and fun to look at. 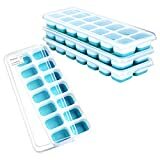 As a bonus, you can use these ice cube trays for multiple purposes like chilling your drinks, meal prep, baby food prep as they are microwave- and oven-safe (max temperature is 446F/230℃). The package comes with a funnel for easily filling the water and a removable lid to prevent contamination and spillage. 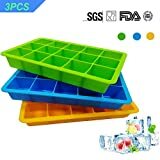 The SAWNZC Ice Cube Trays can be bought on Amazon for $9-$11. The Vremi silicone ice cube trays are crafted from premium food-grade silicone. Each tray makes 21 square-shaped ice cubes. The ice cube trays can be used in the freezer, oven, microwave, and dishwasher. Vremi trays come in shades of blue and green. The sizes of the cubes can be put into a medium-to-wide-mouth thermos or bottle. It's easy to remove the ice cubes from the tray by just pushing up from the bottom. The trays are rectangular shaped and frost-resistant. They also come with two hard plastic lids that make storage safe and convenient. 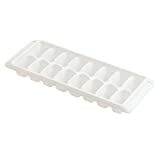 The design of these ice cube trays makes them ideal for use in RV or dorm room mini fridge. You can use them to store frozen herbs, make coffee cubes, or prepare dog treats. Vremi Silicone Ice Cube Trays sell on Amazon for around $15. The Adoric Ice Cube Trays are made of silicone and are FDA approved. These high-quality trays are non-toxic, environmentally-friendly, and can withstand temperatures from -104 degrees to 446 degrees Fahrenheit (-40 to 230 degrees Celsius). The product does not crack when subjected to different temperatures. The silicone makes it dishwasher safe, easy to clean, and reusable. 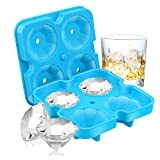 The tray comes as a bundle of two trays that make 6 large ball-shaped and 6 large square-shaped ice cubes, respectively. The tray edges are raised to prevent the ice balls or ice squares from sticking together. This is a distinctive feature of the product when compared to other ice cube trays. Get the Adoric Ice Cube Trays from Amazon for $13. The Rabbit Clear Ice Cube Tray is a especially designed to make crystal-clear ice cubes for scotch or whiskey. It is an essential addition to any bar or kitchen. This specialty tray includes an insulator that ensures that the water freezes from the top down for clear ice cubes. The size of the cubes ensures the cubes are slowly melting which means less dilution in your drink. The tray comes with four silicone molds. The Rabbit Clear Ice Cube Tray sells for $12 (sale) on Amazon. You can buy the product here. The OXO Good Grips ice cube tray is available as a single pack or a 3-pack. It also features a flexible but sealed lid that allows you to stack several of these trays or store them at any angle in the freezer. The sealed top also keeps odors at bay. The tray is made of durable food-grade plastic. The innovative design of this product makes it easy to remove the ice cubes and clean the tray. This ice cube tray is available on Amazon for approximately $10 or $60 (the three-pack). 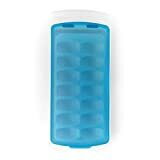 Rubbermaid Easy Release Ice Cube Tray is durable, easy to use, and can be stacked safely without sticking. It is available as a single pack, 2-pack, 4-pack, or 24-pack. These affordable trays' design allows the water to be channeled for quick filling up. Buy one Rubbermaid easy release ice cube tray for $2 on Amazon. Arctic Ice tray is one of the best ice cube trays on the market. Each Arctic chill ice cube tray can make eight 2'' ice cubes for whiskey, ice tea, coffee, vodka, and more. The extra large cubes will not crack or break when released thanks to the tray's design and material. The BPA-free and non-stick silicone used for this tray makes a reliable and safe product. The lifetime warranty and 100% money back guarantee can only further prove this product's durability, safety, and reliability. Get the Arctic Chill ice cube tray from Amazon for approximately $12. You can but this product here. Komax Ice Cube Tray is designed to ensure you get no spills. No matter the angle you place it before freezing this tray's sealed lid remains firmly in place. The design includes a contoured handle that for easy handling. The air-tight lid also prevents the cubes from absorbing freezer smells. You can stack the trays for space convenience. The tray is easy to clean and dishwasher safe. The Komax ice cube tray is sold on Amazon for around $19 (the 4-pack). The best ice ball makers you can buy this year. The best ice buckets out there. A good party is not only about a good atmosphere, the company, and the foods and drinks. Oftentimes, the fun is in the details, like those ice cubes to chill everybody's drinks. Just imagine how some odd tasting ice cubes can ruin some person's drink or even night. So, using one of the best ice cube trays to make those cubes can make a huge difference. We hope our review has just made your purchase decision easier. And feel free to share your thoughts with us in the comment section below. How Is Ice Cream Made and Served? Here’s the Inside Scoop.